It is finally here. Our long awaited spring is upon us. After our summertime caching efforts, we parted ways and each spent the winter working on separate endeavors. My hiking partner, Ben, spent the winter setting up the infrastructure for a new sawmill in his family's woods in western Oregon. Meanwhile, I headed north to work another season as a fisheries observer on Alaskan commercial fishing boats in the Bering Sea. It was a nice opportunity to occupy ourselves over the long winter as our departure date drew nearer. And now with 2 weeks left till we hit trail, preparations are starting to buzz. We finally received our much coveted Grand Canyon backcountry permit in the mail. The crux of the trip, the GCNP permit covers our 20-days in heart of the gorge. To secure access to the Canyon's backcountry, applicants must submit a detailed itinerary four months in advance. But even then its tricky. Prime spots fill up quickly, and there's not much room to maneuver. Lucky for us, we pulled a few strings and were able to secure the route we needed to pass through the canyon. The other park permits were a piece of cake by comparison. I've been tweaking and finalizing my gear list. Everyday, I come up with another item I think I should add to the pack. My base weight is a bit heavier than I would like, without the requisite food and water. It has been tough trying to prepare for and anticipate a mulitude of conditions on a single continuous trip: snowshoeing over the Henry Mountains at 11,000 feet; travelling (and depending on the weather, very likely floating...) down the Escalante River; packing 3 days of water over the bone dry Kaiparowits Plateau; bushwacking game trails in the Grand Canyon in 110F heat. 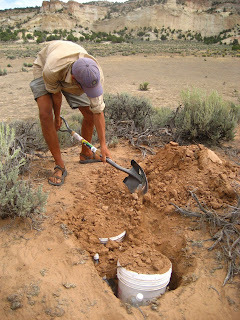 Fortunately, we will be able to ditch excess or unnecessary gear at the cache sites, and retrieve it all at the end. Also, things like the snowshoes and trail boats will be dropped off at the sections they will be needed. But the most troubling part of our preparations has been this winter's weather. The Colorado Plateau received an above average snowfall in the higher elevations. An abundance of winter precipitation might replenish the pot holes and desert water supplies, potentially reducing the amount of water we have to carry. But it could also mean excessive spring runoff when the warmer weather arrives, flooding the canyons and river drainages. Dark Canyon, the Dirty Devil, the Escalante, and Tapeats Creek may all pose problems for us if the flow is too high. In 2005, Hayduke creator Mike Coronella had to abandon his solo attempt part-way through after a winter of heavy snowpack and high spring flows. So we'll just have to see how it goes, and hope Mother Nature doesn't pull a fast one on us.